Is the Morro Bay Offshore needed? With the passage of the California SB-350, the retirement of coal generation, aging gas-fired, biomass, and nuclear generation, coupled with a growing demand for electricity in the transportation sector, California will see a significant increase in demand for renewable energy after 2020. Offshore wind, with its relatively flat production profile over a 24-hour period, can be built near demand centers and existing transmission facilities, offering valuable grid-management benefits and diversity of supply. Is offshore wind energy cost competitive? Over the last 30 years, the cost of energy from land-based wind farms has fallen steadily as technology and construction methods have improved. These accomplishments lead to the reduction of wind energy cost that is now on par with other sources of energy generation. Though offshore wind is new in the U.S., as of February 2016, over 11,000 megawatts of offshore wind have been installed in Europe. 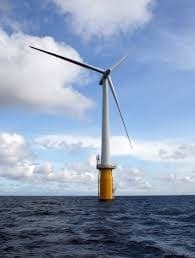 The U.S. DOE estimates that that offshore wind costs, like land-based wind costs, will decrease significantly by the 2025.. Trident Winds projects the price of energy produced buy its Morro Bay Offshore project will be competitive in the California markets of 2025 and thereafter. What kind of local jobs will this project create? The Morro Bay Offshore project will require a ready workforce ranging from engineers, offshore construction personnel, technicians and tugboat operators to support project execution and operation. The ultimate extent of the economic contribution of the Morro Bay Offshore project will be quantified as detailed project plans are developed. How much of the project will be built and serviced locally? Once is service, we expect the Morro Bay Offshore operations and maintenance personnel to live locally and work and service the project from nearby shore-based facilities. 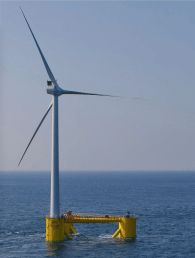 Due to the size of the offshore wind components, the final assembly of the floating offshore wind systems needs to be done as close to the installation site as possible. The Port of Morrow Bay is a working waterfront servicing a vibrant commercial fishing industry that makes up the backbone of a robust and diverse economy of Morro Bay. The Port is home to two aquaculture businesses, nine charter vessels that conduct recreational and commercial trips, one marine construction operator, marine chandlery/marine supplies stores and seafood processing facilities. Presently the Port of Morro Bay does not have an adequate infrastructure for staging the assembly and deployment of floating offshore wind units, but the Port could serve as a good location for a project maintenance facility. Trident Winds has established open channels of communications with MBCFO and plans to continue to work closely with local marine and portside businesses. Will the birds and the marine life be affected by the project? All large land and ocean renewable energy projects impact the biosphere to some extent. Floating offshore wind projects are among the most environmentally friendly in generating electricity from a renewable energy source. The distance of over 25 nmi offshore from Pr. Estero for the Morro Bay Offshore project site, keeps the project outside of whale migration corridors and where there are far fewer birds, fish, and other wildlife. Trident Winds will be conducting the baseline characterization studies of the site area and has been engaged in conversations with NOAA, environmental groups, and fishing groups to ensure that the selected site area will offer minimize operational impacts. How do offshore wind and fishing co-exist? The Morro Bay Offshore project team has been engaged in dialogue with the Morro Bay Commercial Fishermen Organization (MBCFO) since the project inception in mid 2015. Based on the inputs from the MBCFO, Trident has endeavored to site the project outside of major fishing grounds. Trident Winds will continue to work with the local fishing groups, NOAA and others to ensure co-existence with other ocean activities in the area. Morro Bay Offshore is a floating offshore wind farm that is planned to deliver 650 megawatts of clean, renewable energy to the California. On January 14, 2016 Trident Winds submitted an unsolicited lease request to the Bureau of Ocean Management stating its intent to lease the requested site area on the Outer Continental Shelf for the installation of approximately 100 floating offshore wind systems (FOWS). How large is the site area and is there an exclusion zone? The gross size of the requested project site area is 106.17 sq mi (275.04 km2 or 67,962 ac). The final site area will be significantly smaller and will be finalized following the completion of the detailed site characterization of geophysical, oceanographic, and seabed conditions. The final area for the wind farm will be approximately 55.58 sq mi (144 km2 or 35,582.40 ac). There is no exclusion zone required on the wind farm perimeter, but the area will prohibit commercial fish trawling and netting. All three top turbine suppliers – GE, Siemens and MHI-Vestas have commercially available offshore wind turbine generators (OWTG)s larger than 8 MW, with GE leading the industry with a 12 MW turbine. A number of floating support structures, are expected to be available for commercial use at the time of the project construction, estimated to be in the 2023 time-frame. The two examples of floating support structures are Equinor’s (formally Statoil) Hywind and Principle Power’s WindFloat. The Hywind, outfitted with Siemens 2.3MW OWTG has been in operation since October 2009 (Figure 1) off the coast of Norway. In October 2017, Equinor completed installation and commissioning of the Hywind SCOTLAND pilot park consisting of 5 OWTGs, 6MW each (https://www.equinor.com/en/what-we-do/new-energy-solutions/our-offshore-wind-projects.html). How do the floating offshore wind systems weather storms? The floating offshore wind systems are designed to safely operate under the ocean conditions prevalent at the selected site. Both prototypes, Statoil’s Hywind and Principle Power’s WindFloat have been successfully producing electricity since 2009 and 2011 respectively. Since their deployments, both systems have weathered and successfully performed in significant storm conditions. How are the floating offshore wind systems secured to the ocean floor? Floating support structures utilize multiple mooring lines and anchors to secure the structure to the ocean floor, similar in concept to a boat kept in place with a dropped anchor. Will the wind farm be visible from shore? 32.7 nmi – is the length of the cable that will carry generated electricity to the water outflow tunnel on the north side of Morro Rock. The OWTG placed on either the Hywind or the WindFloat FOWS will be approximately 400 feet (120 m) above the sea level. Based on the Coast Guard Light List volume Vi, Pacific Coast and Pacific Islands (http://www.navcen.uscg.gov/pdf/lightlists/lightlist%20v6.pdf) 400 feet tall structures will not be visible by an observer at the sea level at distances greater than 23.4 nmi. The project’s navigational lights may be visible from certain shore vantage points on a very clear night. When will Morro Bay Offshore be operational? The Morro Bay Offshore is planned to enter into commercial operation in the 2025 time frame.